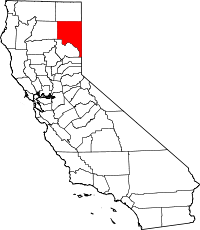 Lassen County is a county in the northeastern portion of the U.S. state of California. As of the 2010 census, the population was 34,895. The county seat and only incorporated city is Susanville. Lassen County comprises the Susanville, California, micropolitan statistical area. A former farming, mining and lumber area, its economy now depends on employment at two state and one federal prison; the former two in Susanville and the latter in Herlong. In 2007 half the adults in Susanville worked in one of the facilities. Lassen County was formed on April 1, 1864 from parts of Plumas and Shasta counties following the two-day conflict known as the "Sagebrush War", also called the Roop County War, that started on February 15, 1863. Due to uncertainties over the California border, the area that is now Lassen County was part of the unofficial Nataqua Territory and Roop County, Nevada during the late 1850s and early 1860s. The county was named by European Americans after Peter Lassen, along with Lassen Peak, which is in adjoining Shasta County. Lassen was one of General John C. Fremont's guides, and a famous trapper, frontiersman and Indian fighter. He was murdered under mysterious circumstances near the Black Rock Desert in 1859, and his murder was never solved. By the 1880s small towns began to spring up all over Lassen County. Bieber developed at the north end of the county, in rich farm land. Gold was discovered at Hayden Hill, and the small town developed to support the miners. Hayden Hill no longer exists: when the mining stopped, the townspeople left for other communities. Madeline was formed at the north end of another rich farming valley, and along the railroad tracks heading north to Alturas, California. This community still has about 50 people living in and around the town. A narrow gauge railroad, the Nevada-California-Oregon Railway, ran through Lassen County from 1880 to 1927. The NCOR was the longest small gauge of the century. It was intended to connect Reno, Nevada to the Columbia River, but only 238 miles (383 km) of track were laid, from Reno to Lakeview, Oregon. In 1913 the Fernley & Lassen Railroad was built and it was used to export timber from the large forests of Lassen County. As this railroad was completed, the Red River Lumber Company set up shop, building the town of Westwood, California to support its massive logging operation. Two other lumber mills followed the Red River Lumber Co. They built their mills in the county seat of Susanville. The Lassen Lumber and Box Company and the Fruit Growers Company both operated mills in Susanville for several decades. In 2003, Redding-based Sierra Pacific Industries, announced plans to relocate or lay off 150 workers as they closed the last lumber mill in Susanville, due to the lack of large timber for the mill. Sierra Pacific chose to close the mill permanently rather than spend the several million dollars required to convert the mill from large to small timber. Since the late 20th century, three prisons have been opened in and near Susanville: California Correctional Center (minimum security, 1963) and High Desert State Prison (California) (maximum security, 1995), both in the city; and the nearby Federal Correctional Institution, Herlong (opened 2007). In 2007, half the adults in Susanville worked in one of the three prisons. In "job-starved rural America, ... residents see them [prisons] as the last and only chance for employment after work at the lumber mill or the dairy dries up." According to the U.S. Census Bureau, the county has a total area of 4,720 square miles (12,200 km2), of which 4,541 square miles (11,760 km2) is land and 179 square miles (460 km2) (3.8%) is water. Part of Lassen Volcanic National Park extends onto a western corner of the county. The 2010 United States Census reported that Lassen County had a population of 34,895. The racial makeup of Lassen County was 25,532 (73.2%) White, 2,834 (8.1%) African American, 1,234 (3.5%) Native American, 356 (1.0%) Asian, 165 (0.5%) Pacific Islander, 3,562 (10.2%) from other races, and 1,212 (3.5%) from two or more races. Hispanic or Latino of any race were 6,117 persons (17.5%). As of the census of 2000, there were 33,828 people, 9,625 households, and 6,776 families residing in the county. The population density was 7 people per square mile (3/km²). There were 12,000 housing units at an average density of 3 per square mile (1/km²). The racial makeup of the county was 80.8% White, 8.8% Black or African American, 3.3% Native American, 0.7% Asian, 0.4% Pacific Islander, 3.2% from other races, and 2.7% from two or more races. 13.8% of the population were Hispanic or Latino of any race. 13.8% were of German, 12.1% Irish, 10.5% English, 8.7% American and 5.0% Italian ancestry according to Census 2000. 88.2% spoke English and 10.3% Spanish as their first language. There were 9,625 households out of which 35.9% had children under the age of 18 living with them, 55.8% were married couples living together, 10.3% had a female householder with no husband present, and 29.6% were non-families. 24.5% of all households were made up of individuals and 9.2% had someone living alone who was 65 years of age or older. The average household size was 2.59 and the average family size was 3.08. In the county, the population was spread out with 21.8% under the age of 18, 10.8% from 18 to 24, 36.9% from 25 to 44, 21.4% from 45 to 64, and 9.0% who were 65 years of age or older. The median age was 35 years. For every 100 females there were 168.8 males. For every 100 females age 18 and over, there were 192.2 males. The median income for a household in the county was $36,310, and the median income for a family was $43,398. Males had a median income of $37,333 versus $26,561 for females. The per capita income for the county was $14,749. About 11.1% of families and 14.0% of the population were below the poverty line, including 16.1% of those under age 18 and 7.8% of those age 65 or over. Lassen is an overwhelmingly Republican county in presidential and congressional elections. The last Democrat to win a majority in the county was Jimmy Carter in 1976. In 2016, Lassen was Donald Trump's best county in the state, with a 50 point margin over the overwhelming statewide victor Hillary Clinton. Lassen County is in California's 1st congressional district, represented by Republican Doug LaMalfa. is in the 1st Senate District, represented by Republican Ted Gaines, and the 1st Assembly District, represented by Republican Brian Dahle. Lassen Rural Bus (LRB) runs a local service in Susanville, and longer distance routes to Westwood and Doyle. Susanville Municipal Airport, Herlong Airport and Westwood Airport are all general aviation airports. The Westwood Airport's runways are no longer maintained and should be used at your own risk. The population ranking of the following table is based on the 2010 census of Lassen County. ^ "Hat Mountain". Peakbagger.com. Retrieved May 27, 2015. ^ a b "Annual Estimates of the Resident Population: April 1, 2010 to July 1, 2016 Estimates". Retrieved April 27, 2017. ^ a b "State & County QuickFacts". United States Census Bureau. Retrieved April 4, 2016. ^ a b c Taylor, Robert. "'Prison Town' a view from outside," Contra Costa Times, 28 July 2007; hosted at Mercury News. ^ Gannett, Henry (1905). The Origin of Certain Place Names in the United States. U.S. Government Printing Office. p. 182. ^ "U.S. Decennial Census". United States Census Bureau. Retrieved September 26, 2015. ^ Staff, Website Services & Coordination. "US Census Bureau 2010 Census Interactive Population Map". www.census.gov. Retrieved 19 March 2018. Wikimedia Commons has media related to Lassen County, California.